Swimming pools are fun for the summertime, but you might not always want to be diving and splashing around. You can also spend some time relaxing at the pool and soaking up the sun. 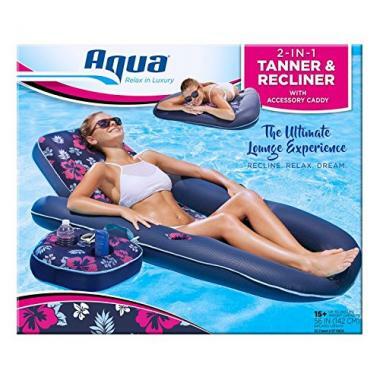 If you want to take make relaxing the most comfortable, you need a top rated pool lounge float. Pool floats are a great way to spend time relaxing in the water. You can lounge around with friends or work on your tan with the best pool lounge floats. Swimming pool loungers are also great because you can keep cool by dipping your hands and feet into the water. 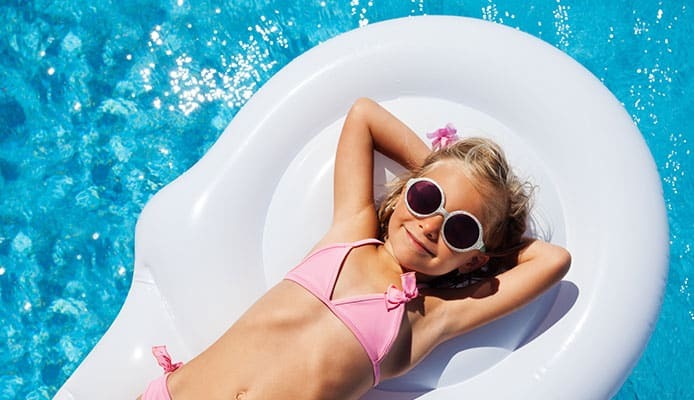 Pool floats are versatile and will quickly become your go to pool accessory. It can be tricky to choose which inflatable pool chair would be the best because there the market is flooded with designs. To help you in your search, we have made a guide that makes it easy to find the best pool lounger. Intex’s Rockin’ Inflatable Lounge will give you the ultimate relaxing experience. 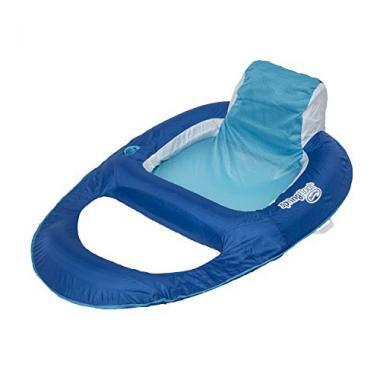 It has a contoured design that provides extra comfort as you float in the pool. It also has a built-in cup holder that lets you keep your refreshing beverage nearby, so that you can easily sip, float, and relax. It has two air chambers and come with a repair patch. This design by Intex mimics that of a chair to ensure you have added comfort. It is made of 18-gauge vinyl, which is both durable and long-lasting. It has 2 air chambers and 2 heavy-duty handles. It also includes 2 cup holders. Intex ensures that it ships in their certified Frustration Free Packaging. A fun design by Intex, this has a transparent top with multi-colored beams. It offers great pool comfort and is easy to float in. Included in the design are a drink holder, arm rests, and a backrest. Intex also includes a repair patch for any air leak emergencies. Swimline is a top notch brand that has essentially created a floating tub. It provides ultimate comfort and allows you to easily tan in the sun. It holds one person and is safe for ages 13 and above. The tub part of the design, where the user sits, can be filled with water for extra cooling comfort. The Float Recliner has all the best comfort features in one design. The Spring Float Recliner has a backrest, headrest, cup holder, and ottoman. It is the only fabric covered pool float that has a patented inner spring, which provides greater stability and comfort in the water. It has cooling mesh to allow you to soak a little in the water. It comes in a variety of styles that are safe for adults, kids, and babies. The float is also great for traveling due to it’s compact design. The entire float and all its features will fold flat into three rings, which make it ultra-portable. 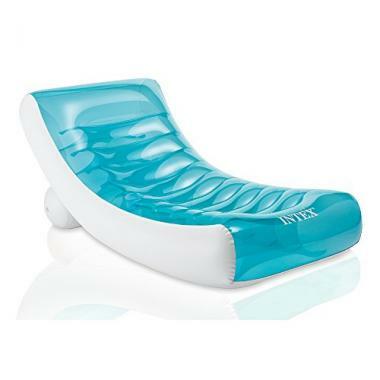 SwimWays offers a stylish and comfortable way to relax from head to toe. It can be safely used in any pool or lake. The nylon mesh and fabric are soft to the touch, but durable. It also comes with a mesh carrying bag for easy storage and transportation. If you are looking for a couch design, the Solstice Cooler Couch is for you. It has a heavy-duty vinyl construction. It has a handy on-board cooler to store your drinks and a set of drink holders to keep them at arm’s reach. With Swimline’s design, you’ll be so comfortable that you can spend all day floating in the pool without ever having to leave the water. For ultimate comfort and reclining ability, choose Aqua’s Ultimate Recliner and Lounge. With the adjustable backrest, you can select your comfort level from upright to fully reclined. It has an attachable caddy feature for 2 beverages and 1 snack. The oversized cup holder can also keep your tanning lotion close for easy access. It has a soft, cool weave fabric which ensures the design is wire-free and high-quality. The material is also strong enough to support up to 250 pounds. It has carry handles to make portability a breeze. It can also be easily inflated and deflated with the two-valve Duo-Lock system. If you want both arm and backrests, the Comfortable Inflatable Lounge has you covered. It also has one cup holder. It has a durable I-beam construction, which makes it easy to inflate and deflate. The material is a strong 12-gauge vinyl and a repair patch is included. 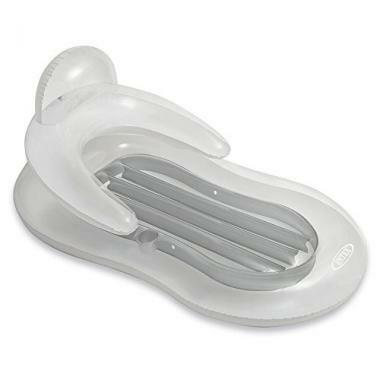 This pool float is covered by a comfortable nylon fabric. It has arm, head, and foot rests for maximum comfort and relaxation. It is also complete with a drink holder. It can be used both inside or outside of the pool for luxurious relaxation. The Sunsoft Mattress is entirely covered in fabric for your comfort. It has a quick, multi-chamber inflation. The mattress also gives an adjustable and cozy bean bag feel in the water. It has a built-in handle and drain to make removing the float from the water easy. If you have are lucky enough to spend your summer around a swimming pool, you know that they are a great place to have fun and relax. Many swimming pools have areas or decks for outdoor patio furniture, but sometimes relaxing poolside isn’t satisfying enough. If you want to relax in the water, pool floats are a great way to kick back and relax, while still feeling the refreshing cool temperatures. 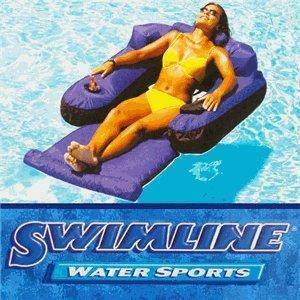 With an inflatable lounge chair pool design, you can float on top of the water and just dip your toes. If you want to spend some time tanning, patio umbrellas will block out the sun. Instead, use a pool lounger to catch all the sun’s rays. Patio chairs and inflatable chairs leave you stuck on dry land. With pool loungers for adults, you can stay in the water from morning to night. However, you should consider a few important features to ensure you have found the best pool lounger. 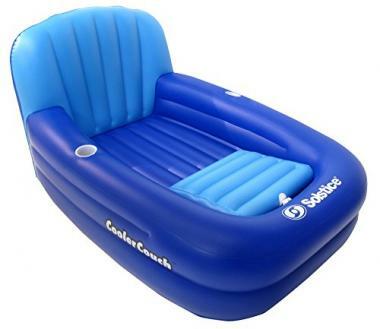 Top rated pool lounge floats will be durable and strong. It will also help to reference pool lounger reviews to see what other users think about a pool lounger design. Pool floating loungers come in a variety of sizes. It’s important that you choose an inflatable pool chair that is just the right size for you. This means that it is not too small or too big. Swimming pool loungers that are too small will struggle to hold the weight of an adult and one that is too big can be hard to maneuver and manage. You should find a pool lounger that will comfortably hold you above the water but isn’t so big that you feel swallowed up in all the material. There are a few different materials that pool floats are made out of. Three of the most common materials are vinyl, plastic, and foam. Vinyl and plastic are especially used in inflatable pool chair designs. Foam is the most common material for non-inflatable designs. No matter which material you choose, it is essential that it is durable. A high-quality pool lounger will be made from high-quality materials. The best materials will make the best pool lounge floats. Pool floats made from high-quality materials will be long-lasting, durable, and comfortable. Your inflatable pool chair shouldn’t leak air or collapse on the first use. It should be durable enough to withstand the pool chemicals and the constant use in direct sunlight. The material should also be comfortable to the touch and should never cause any irritation. There are a lot of different styles of pool floats. From rectangular, oval, or circular shapes, you should have plenty to choose from. 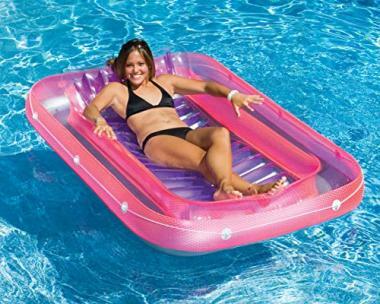 You may also find special pool floats that have a unique shape. Unique shapes may include food items or animals. No matter what you prefer your style to be, you should always find an inflatable lounge chair that makes you happy. With the variety of designs, you can choose sleek and modern or fun and whimsical. You will also have to decide if you want an inflatable or non-inflatable design. Inflatable designs are popular because they are easy to store but do require some time to blow up. 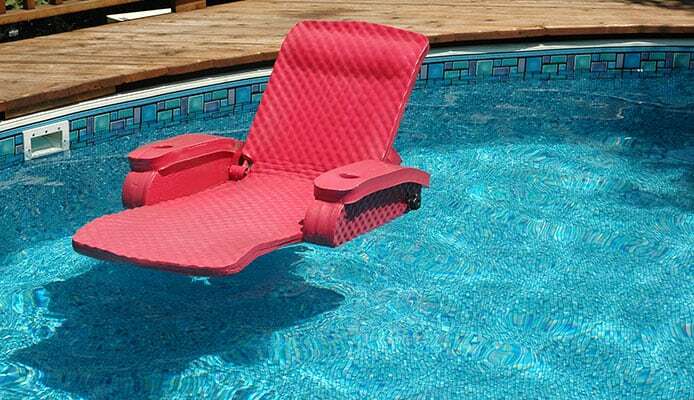 Non-inflatable designs can be used immediately, but they may have limited styles when compared to inflatable pool chair designs. Q: How to clean a pool lounger? A: Pool floats are waterproof. A given, since they are used in the pool. But this also means maintenance is a breeze. You can easily wash any pool float off with a hose or another source of water. If you are in need of specific maintenance or care details, you should check the brand or manufacturer’s provided information. This information will be the most exact and will give you tips on how to clean a pool lounger without accidentally damaging it. Q: Are pool loungers safe? A: Yes. Pool loungers are very safe. Even more safe than pool noodles because they provide a larger surface area that rests on the water. They are strong and buoyant, so that anyone can easily float in the water. The best pool lounge floats are also safe for any type of pool, whether they are inground pools or above ground pools. Most can be used by anyone, regardless of age. However, you should always ensure that children are monitored and never left alone in or around a pool. 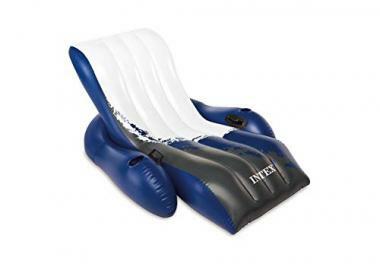 With top rated pool lounge floats, you’ll be the envy in the water. You can lay back and relax, hang with friends, or even sip a few drinks and munch a few snacks, all while you are resting in a pool lounger. With pool floating loungers, your day at the pool went from exciting but exhausting to fun and relaxing. The best pool lounger will be durable enough to be used by everyone throughout the years. So, kick back and relax with the best pool lounge floats. 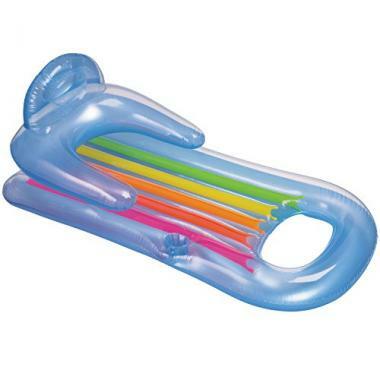 Do you own one of the pool lounger floats that made it onto our list? Let us know how it has worked for your swimming pool needs in the comments section below!